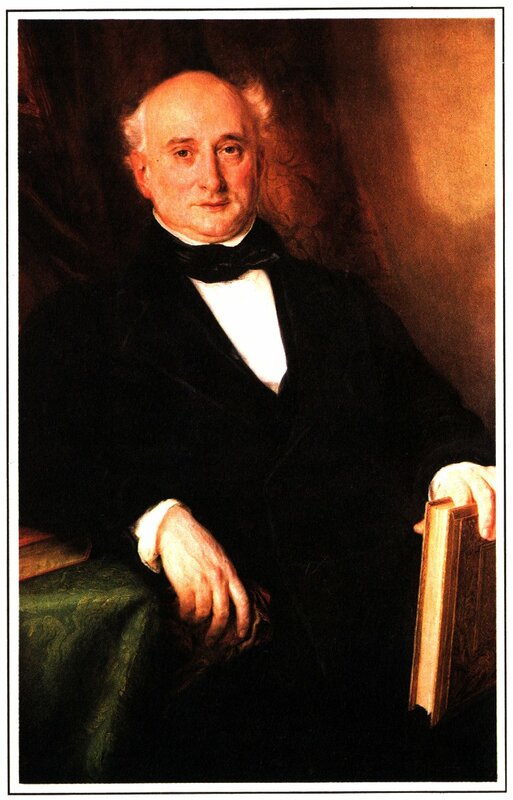 Thomas de la Rue (24 March 1793 – 7 June 1866) was born in a small hamlet in Guernsey called Le Bourg in 1793, the seventh child (of nine) of Eleazar and Rachel de la Rue. At the age of ten he was apprenticed to his brother-in-law Joseph Antoine Chevalier, a master printer in St Peter Port who produced the Gazette de l'Île de Guernsey, the first printed newspaper on the island. During this period Thomas gained a thorough knowledge of printing. 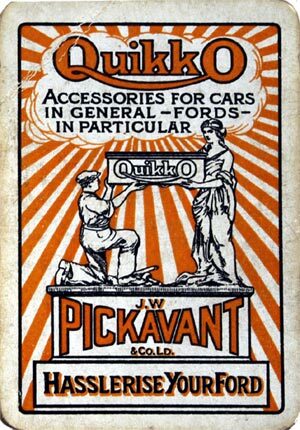 In 1818 he moved to London with his family and set up shop initially as a straw hat manufacturer, but he soon diversified into bookbinding and the embossing of leather, and then into paper manufacture. 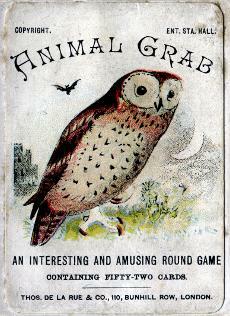 By around 1828 his interests had moved to playing cards and he began to put everything he had learnt into practice. De la Rue introduced letter-press printing and certain other improvements into playing card production and was granted a patent in 1831. He produced his first playing cards in 1832 and over the years came to be recognised as the inventor of the modern English playing card. 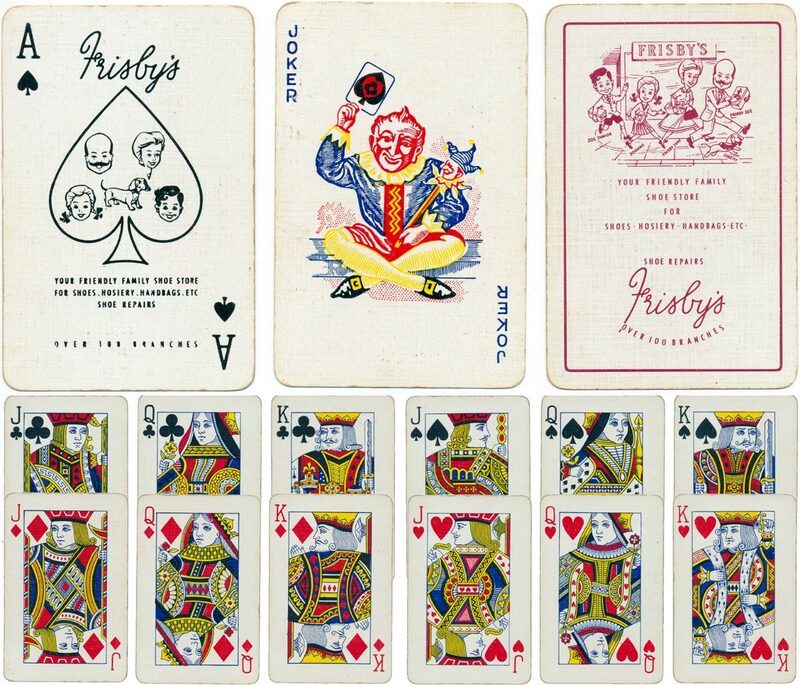 Above: De la Rue's early letterpress playing cards c.1832. 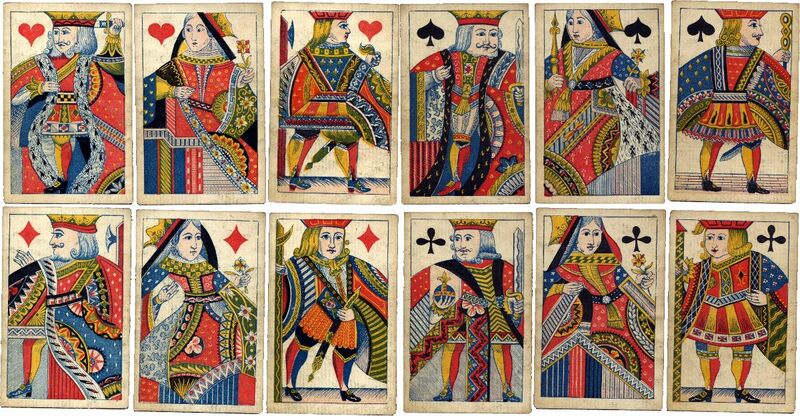 The court figures are full-length but with several non-standard idiosyncrasies such as the king of hearts turned facing towards the right and the queen of diamonds holding a sceptre and a fan. All the suit symbols have a white overlay border in this version. 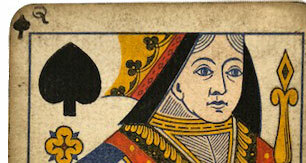 The 'Old Frizzle' Ace of Spades carries the duty of one shilling at the top and has the text "By His Majesty's Royal Letters Patent" printed at the bottom which had been granted to Thomas de la Rue by King William IV for 'certain improvements in making or manufacturing and ornamenting playing cards.' 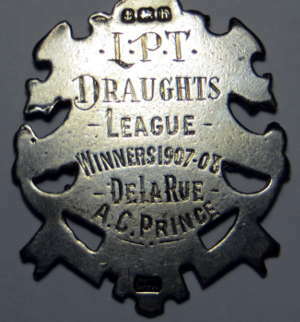 This Ace, with the extra legend, was registered in August 1832, whereas before the patent was granted a normal 'Old Frizzle' Ace was used. 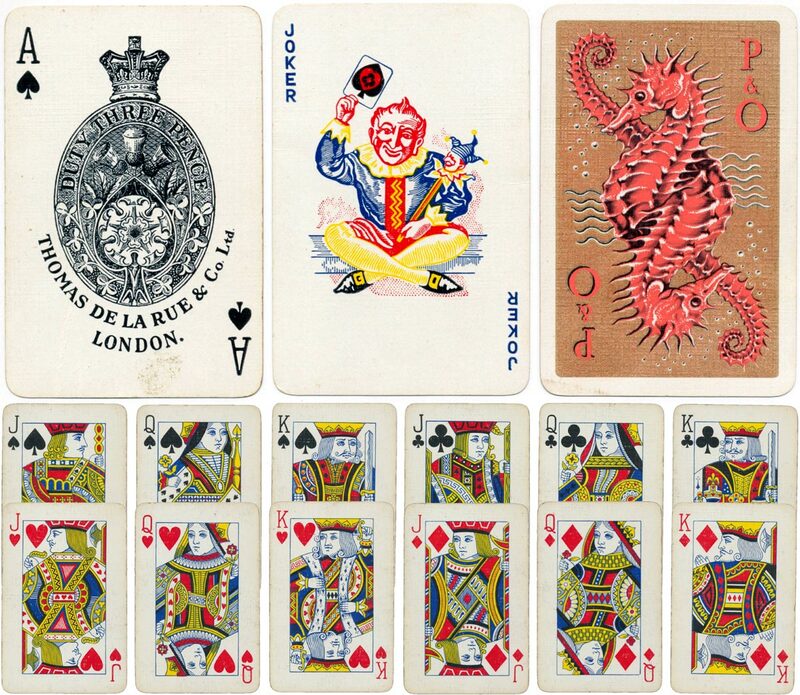 The Aces of Spades were printed in the Stamp Office at Somerset House and an account of the numbers of Aces was kept there by the authorities. Image courtesy Ken Lodge. Above: another of De la Rue's earliest packs of playing cards c.1832, printed by letter-press but imitating traditional woodblock printing. The court figures are full-length. 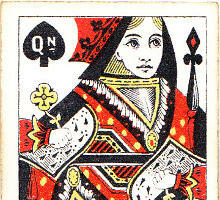 The 'Old Frizzle' Ace of Spades carries the duty of one shilling at the top and has the same text as the above example. 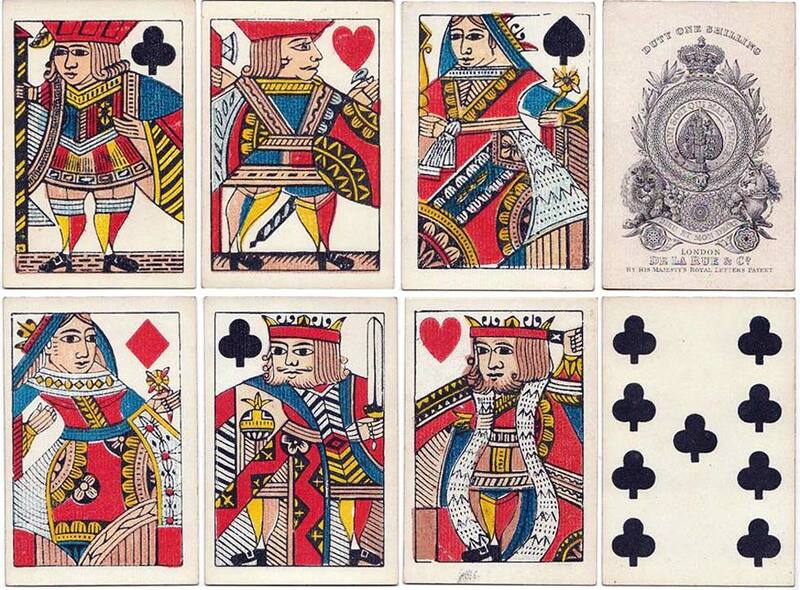 Above: a redrawn set of single-ended court cards with more intricate patterns on the clothing, printed typographically, which became the basis for all later double-ended courts. 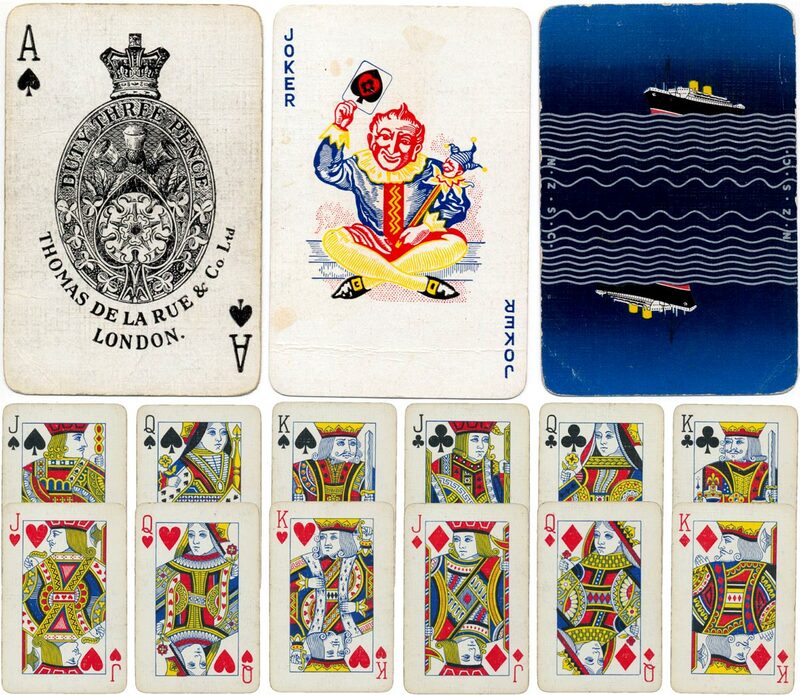 In this case the cards are in the slightly smaller Piquet size, with Continental style suit symbols. 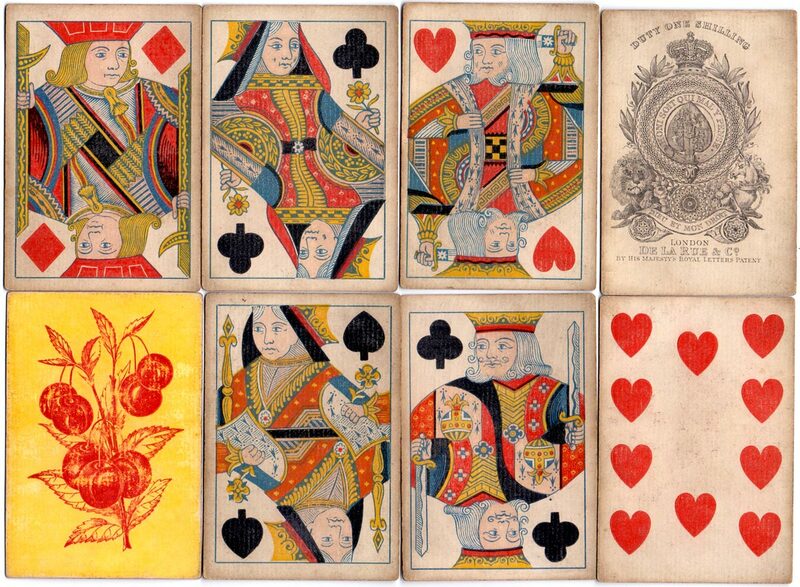 Up til this time playing cards had been printed from woodblocks and hand-coloured using stencils. De la Rue's improvements included quicker drying coloured inks, improved glazing technology and the use of enamelled paper. Learn more →. 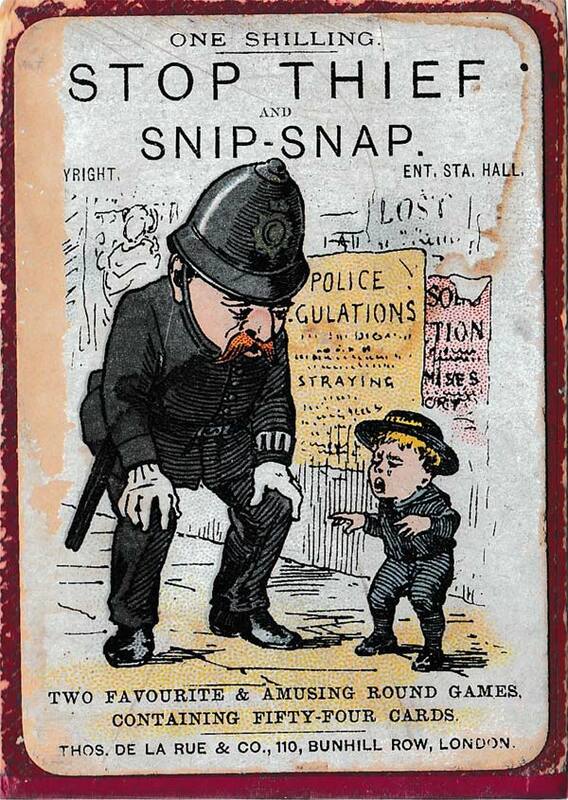 An article in Bradshaw's in April 1842 reported that The whole of Messrs De la Rue's establishment is carried out in a manner perfectly unique. 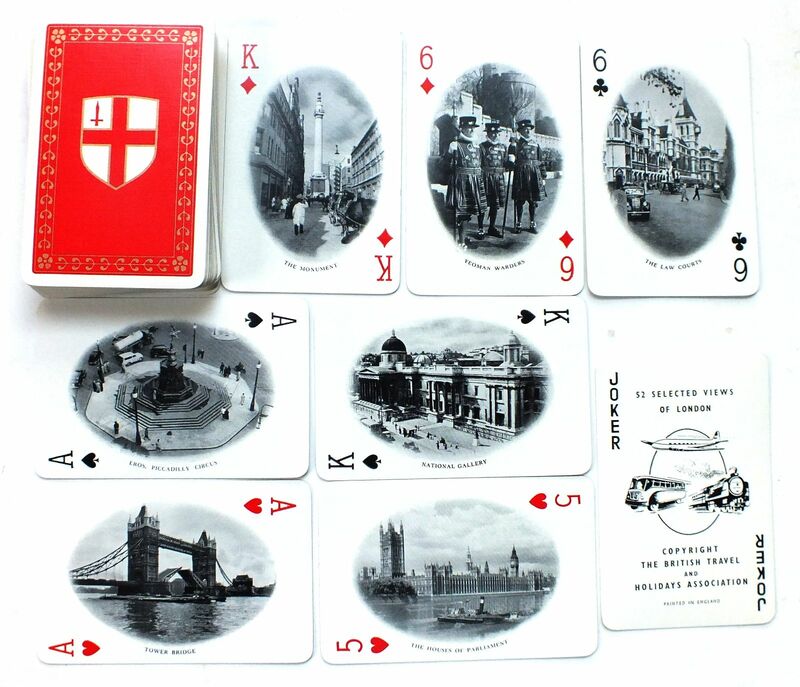 Steam power wherever practicable is applied to the various departments of the business. Between 1856 and 1868 the De la Rue output of playing cards rose from 93,060 packs in 1856 to 265,048 packs in 1868. 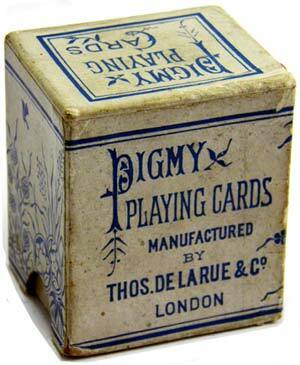 Above: 'Pigmy' playing cards with 'Dexter' indices, c.1890. 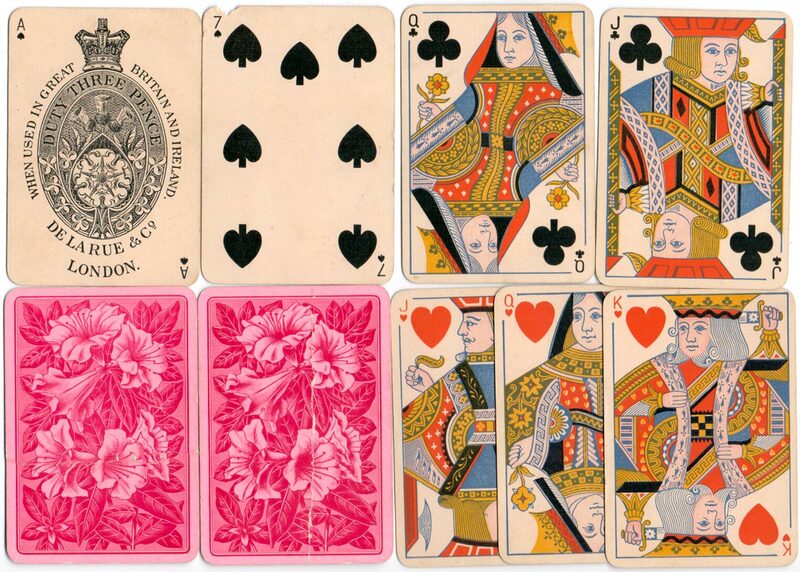 In 1844 Thomas de la Rue employed the graphic designer Owen Jones who in the ensuing 20 years produced 173 outstanding back designs for De la Rue ranging from fruit-and-flower themes to Chinese and Arabesque. 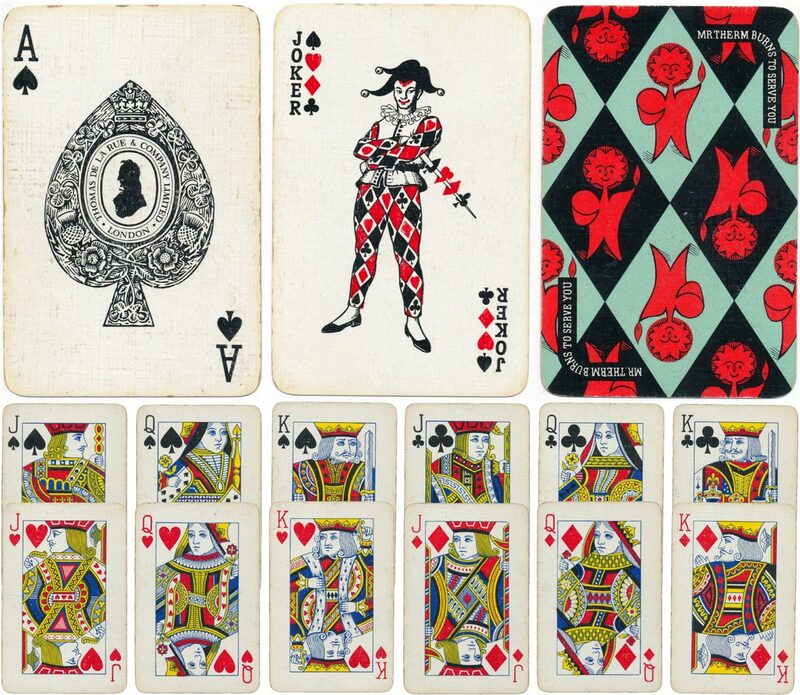 Owen Jones also designed playing card backs for Lawrence & Cohen (USA) and his designs were imitated by other manufacturers. 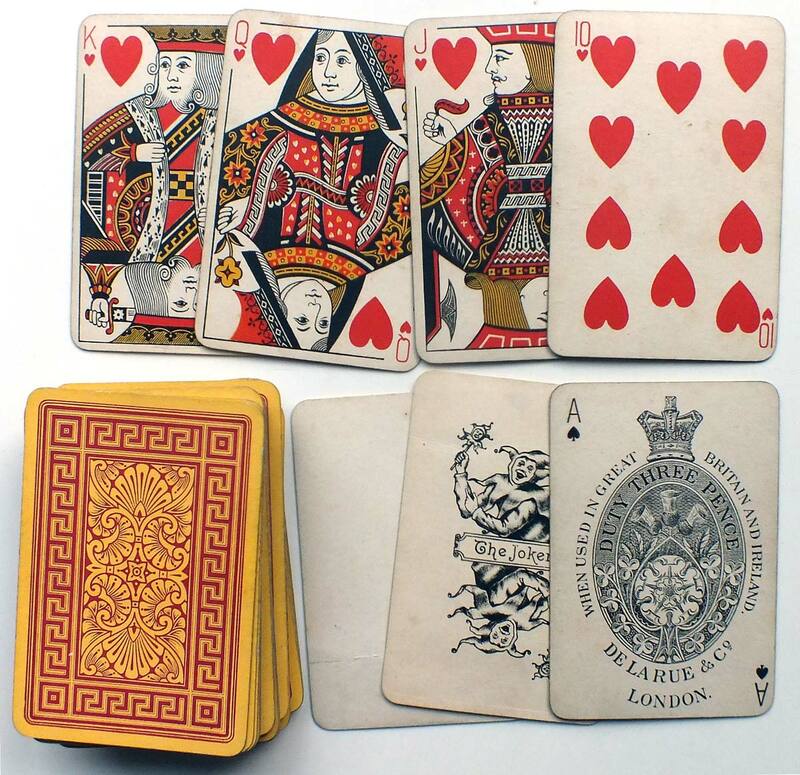 From 1840 until 1856 playing cards remained the firm's chief money maker and this provided a financial basis for any new fields of activity that De la Rue wished to enter. 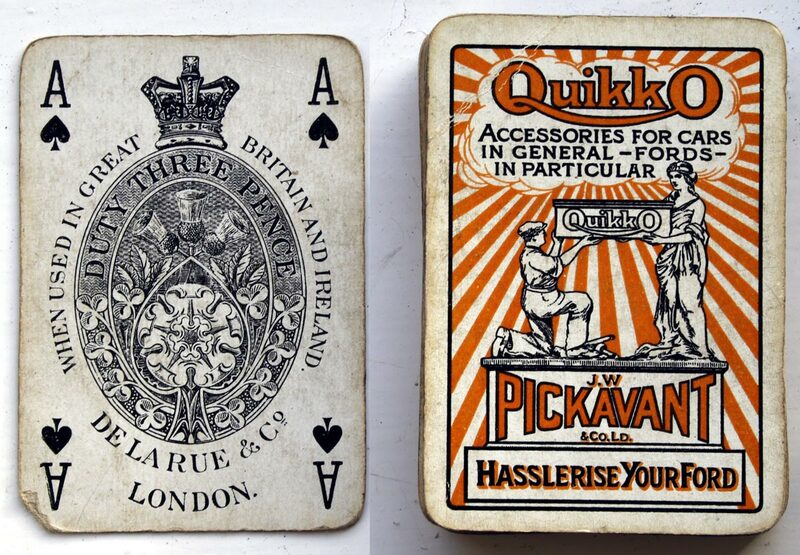 In any publicity material playing cards, their most lucrative product, received pride of place, and in 1853 Charles Dickens extolled the firm's excellence in an article called A Pack of Cards¹ which included a history of playing cards and De la Rue's part in it. 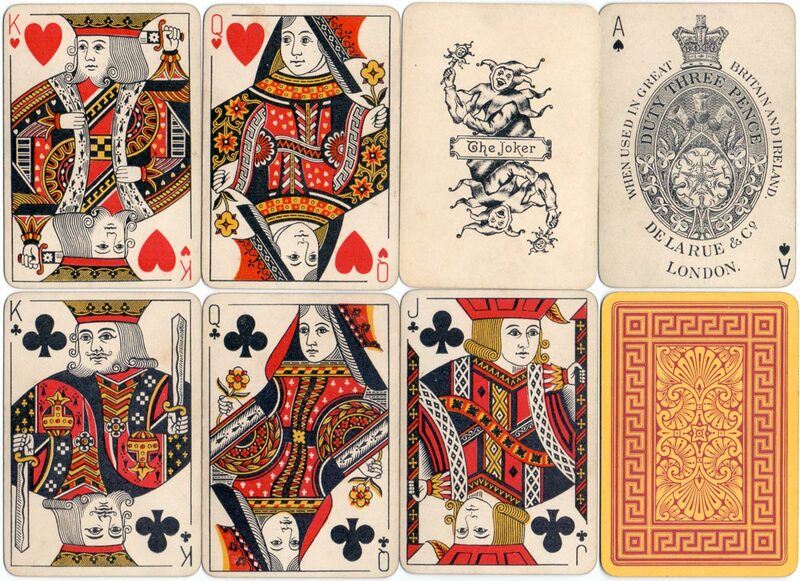 Thomas de la Rue became known as the father of the English playing card. 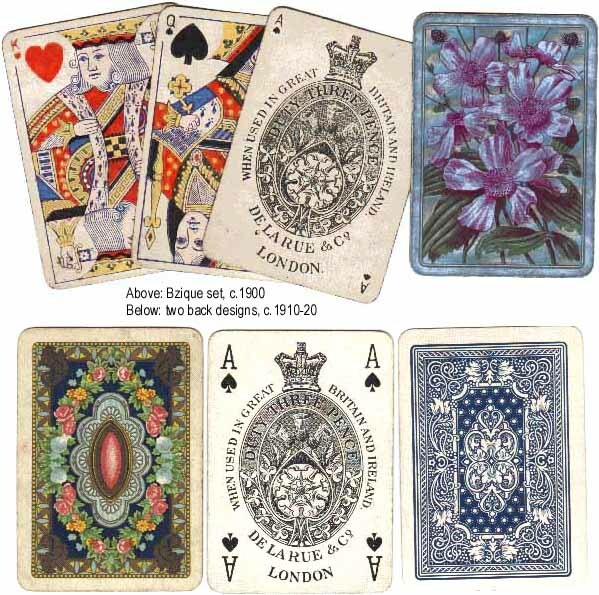 Right: during the period c.1870-1890 indices were being introduced on playing cards. 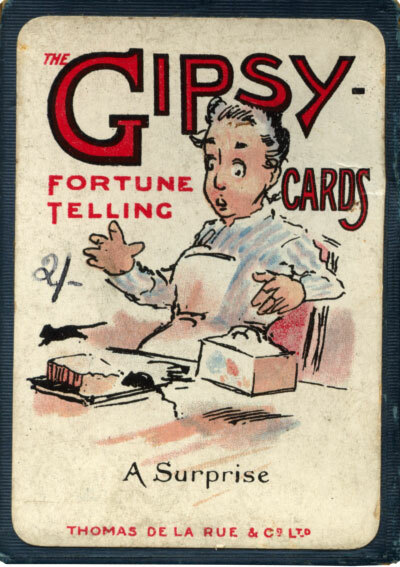 Packs are sometimes found with hand-written indices where players have improvised in interesting ways. 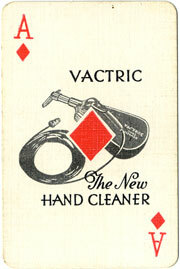 Above: standard double-ended Bézique pack with rounded corners and small indices, c.1890-1900. 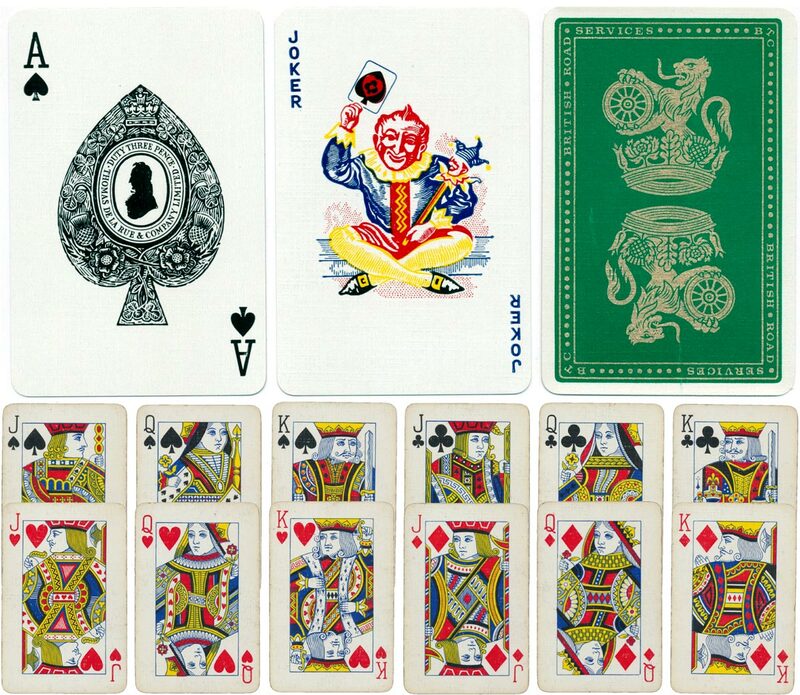 Some of the court cards have been turned so that all the suit symbols are at the top left-hand corner. 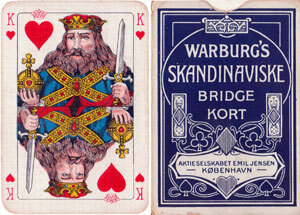 Above: standard 52-card pack plus joker, with rounded corners and slightly larger indices, c.1900. 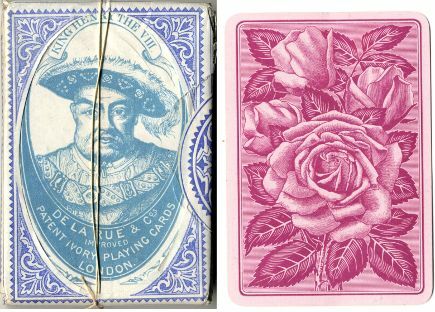 Above: De la Rue & Co's Patent Ivory Playing Cards in their tax wrapper, with the King Henry the VIII wrapper showing beneath, c.1900. 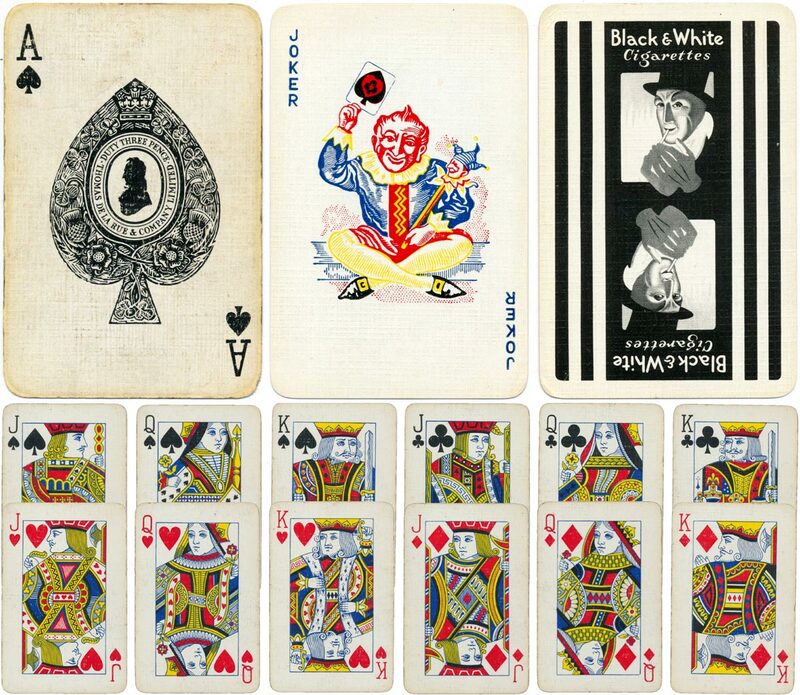 Besides manufacturing playing cards and card games, the firm also printed railway tickets and visiting cards for which he used his enamelled playing-card paper. 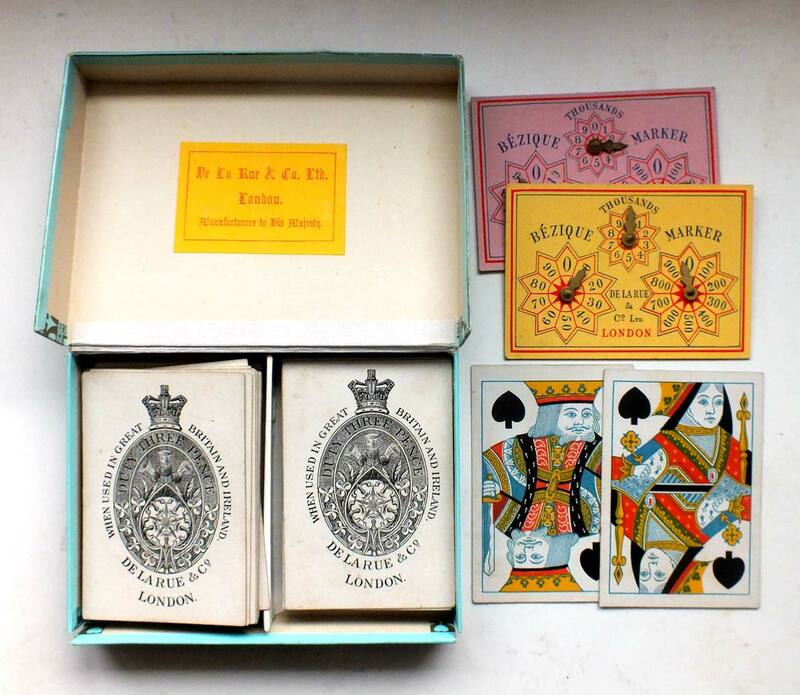 De la Rue’s card games were of the highest quality and tended to be expensive. 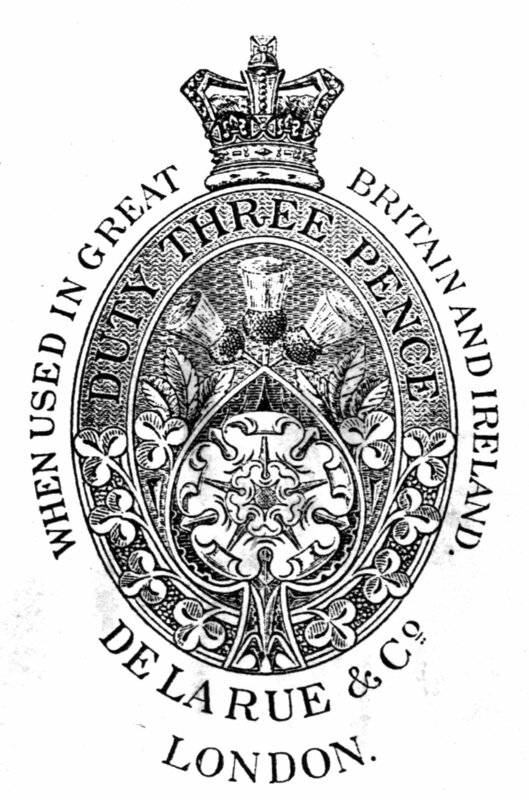 De La Rue became the principal printer of fiscal, inland revenue and postage stamps and banknotes for the UK and colonies, and over the years the best engravers and miniature designers worked for De La Rue. 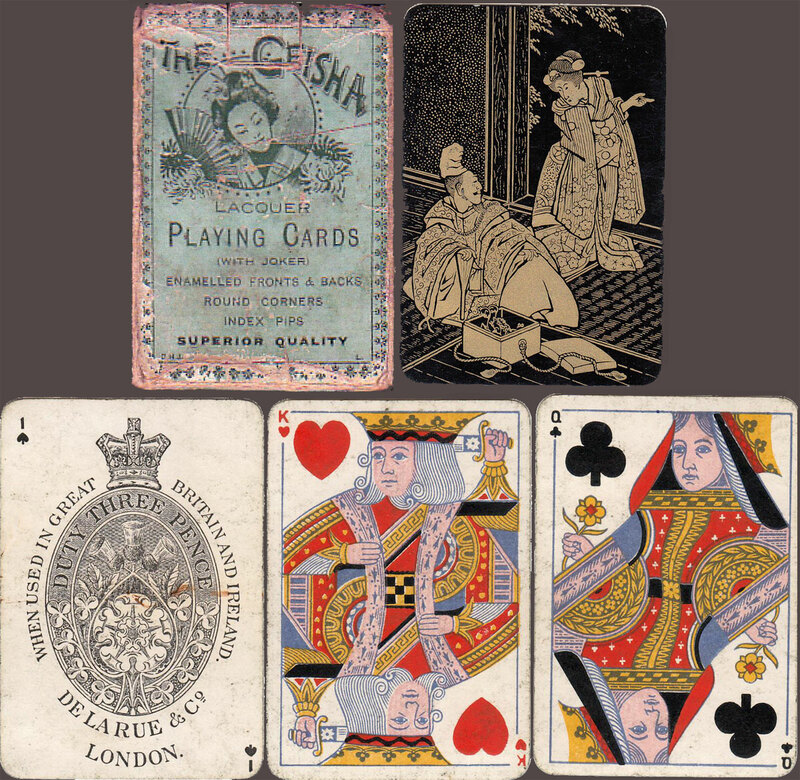 In the 19th century, England was the principal exporter of playing cards to Russia and the name of De La Rue figures prominently in this connection. 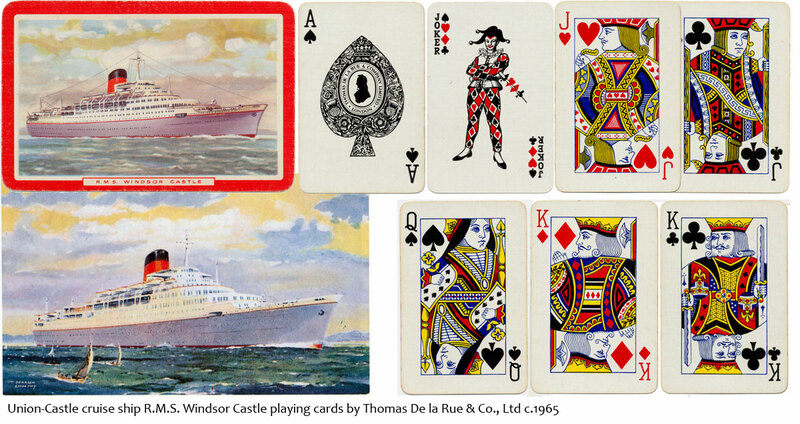 In 1842 Thomas De La Rue's youngest brother Paul was appointed superintendent of the Russian royal playing card monopoly and the Russian establishment became an important customer of De la Rue, and was the firm's first overseas trade... learn more →. 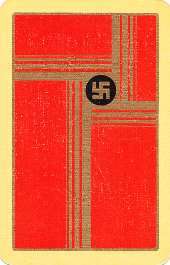 American and Belgian court card designs have been influenced by De la Rue, and for example, Lawrence & Cohen also enjoyed the services of Owen Jones, one of De la Rue's graphic designers. 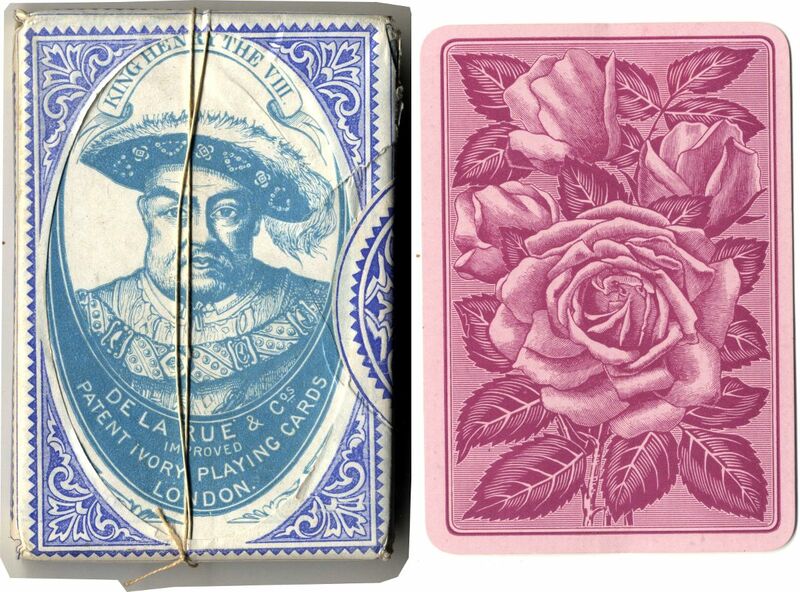 De la Rue opened a New York office and a Parisian office and during the period 1867-70 De la Rue published two non-standard packs specially designed for the French market →. 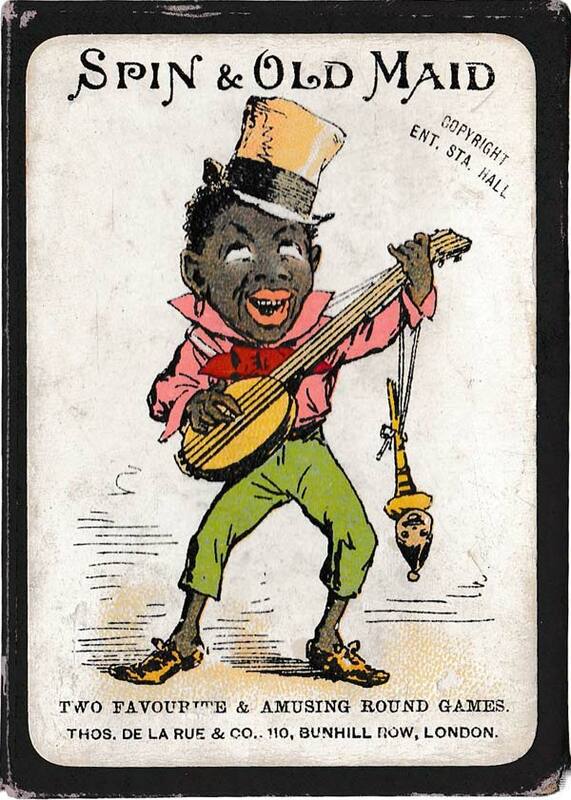 See also: “International Playing Cards”, 1874. 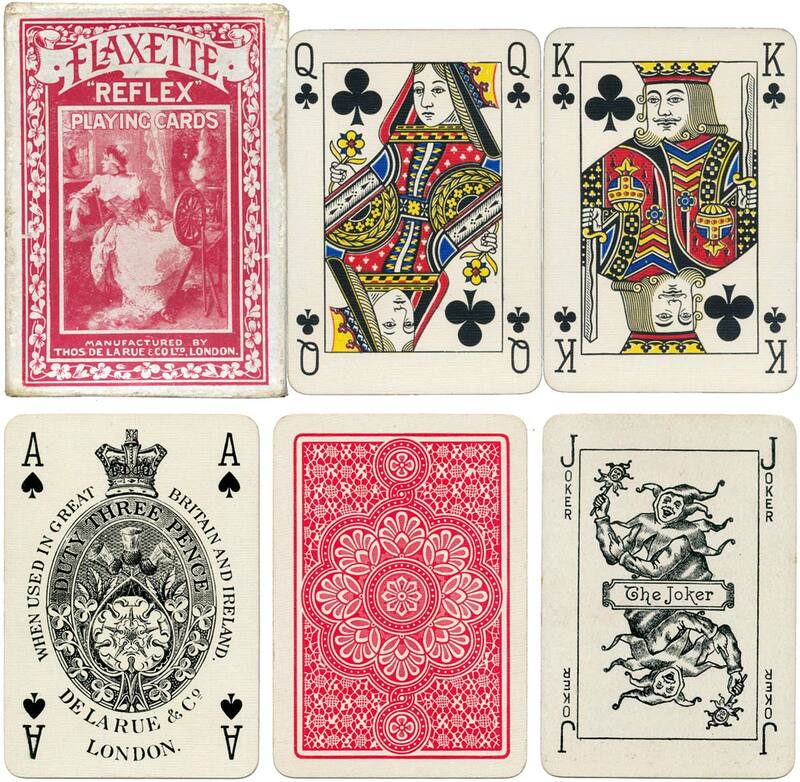 De La Rue also manufactured packs for Denmark and Iran during the 1930s. 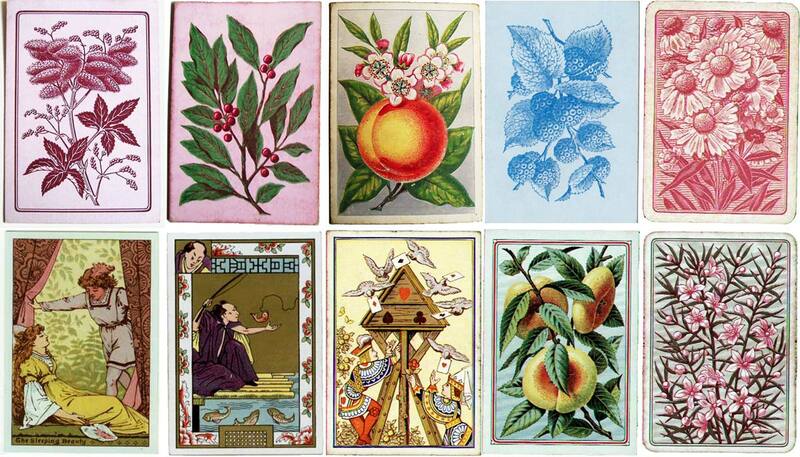 Above: assorted nineteenth century back designs by Thomas de la Rue & Co., Ltd. See also: Owen Jones • ‘Lacquer’ Playing Cards, c.1890. 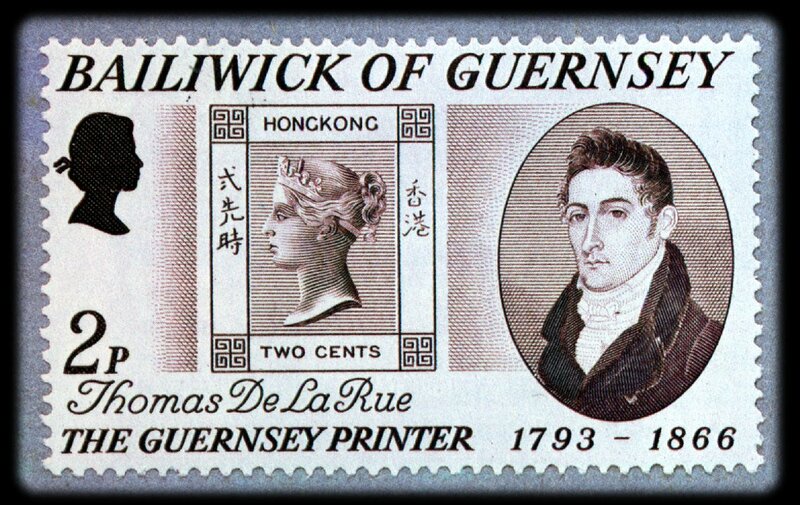 Thomas De La Rue (1793-1866), pioneer printer of the Victorian era, an historic figure for playing card collectors and philatelists. 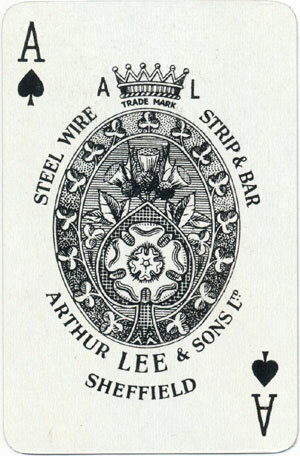 Above: special ace of spades produced for Arthur Lee and Sons Ltd, c.1958. 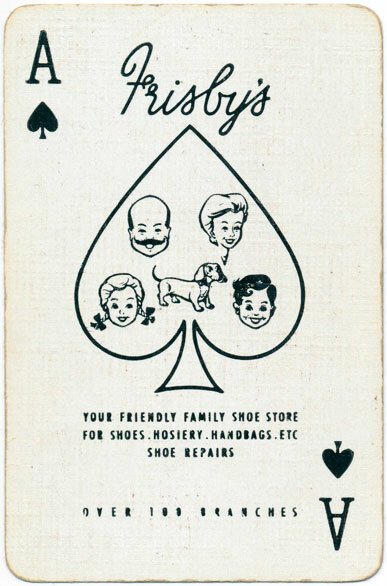 Above: special ace of spades produced for Frisby's Shoe Store, c.1955. 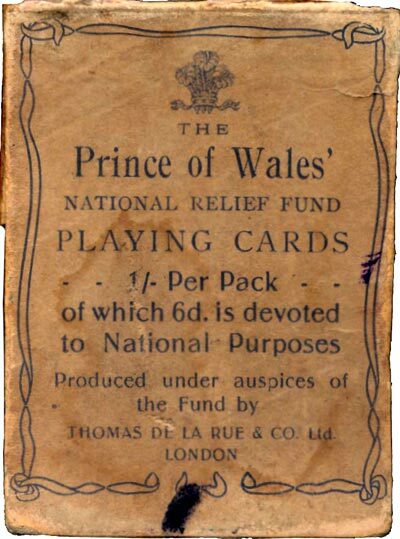 Above: "Pneumatic" playing cards were another of De la Rue's patented innovations. 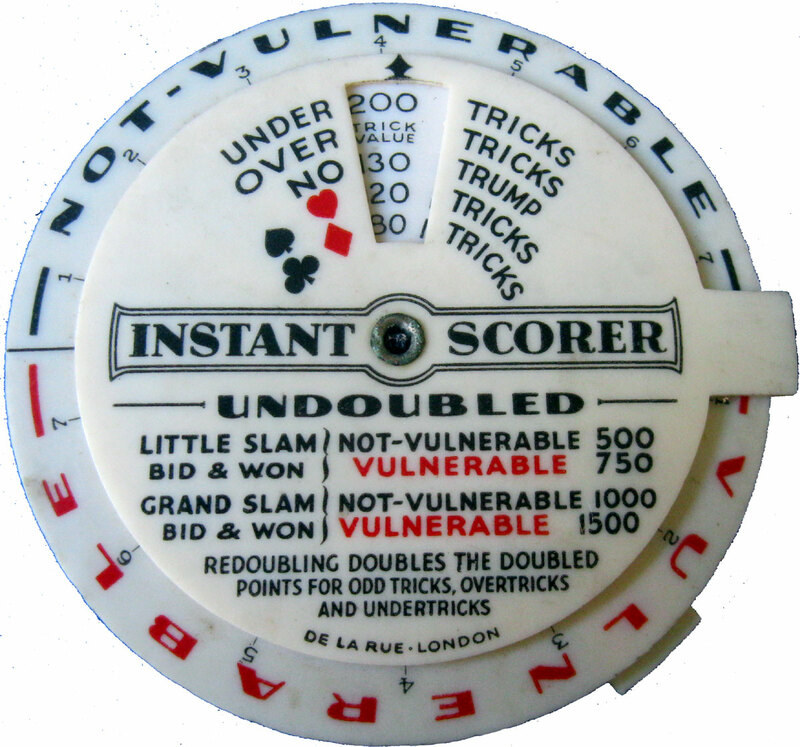 De la Rue’s card games were of the highest quality. 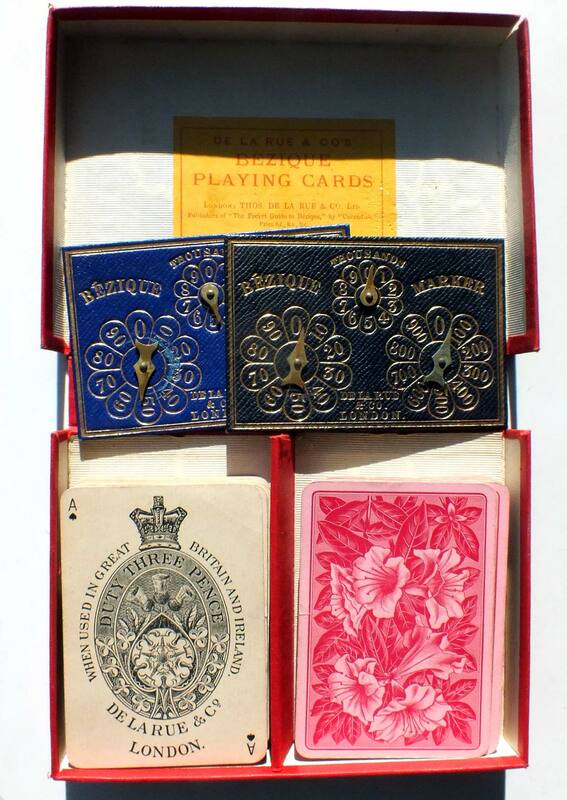 Above: memories of a former playing card cutter who worked for De la Rue c.1880-1920. Above: 'Instant Scorer' from after when Contract Bridge became THE game to play. Judging by the materials and script, c.1950s/60, but earlier if made from celluloid. Image courtesy Kate MacDonald. The company that started life producing straw hats and playing cards almost two centuries ago has become a world leader in high security printing and payment systems technology. Thomas De La Rue International Ltd specialised in the manufacture of banknotes and other security documents, printing, currency counting machinery and money dispensers. It also has interests in the design and sale of banknote printing machinery. 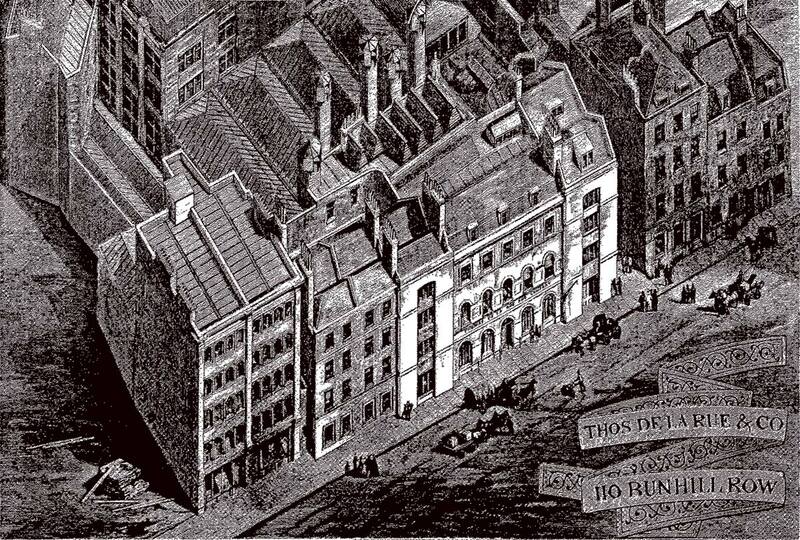 Click here to visit De La Rue's Corporate History website. 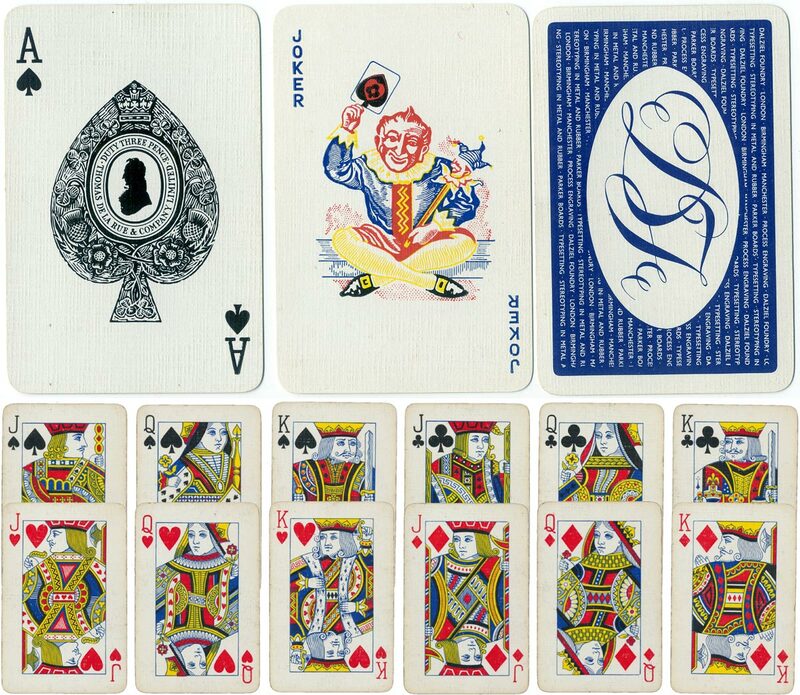 On Monday, 30th November, 1970, the entire De La Rue collection of playing cards was sold at auction by Sotheby's for £12,000 to the Fournier collection, Spain. 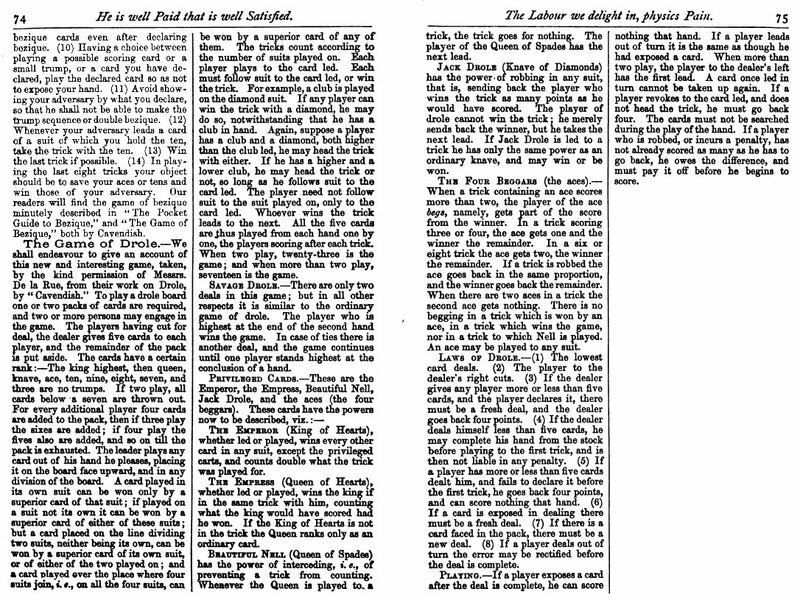 Note: ¹ There was an article called 'A Pack of Cards' in 'Household Words' 18/12/1852, which Dickens edited but the actual article is attributed to a George Dodd. 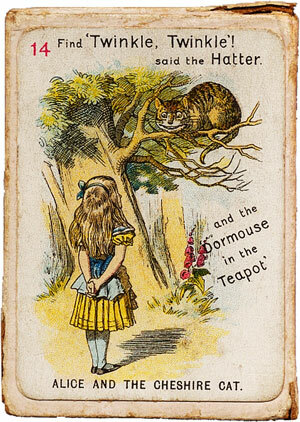 [Source: Charles Dickens Museum].